At UBM we achieve sustainable commercial success through thoughtful market focus and superior results for our customers. 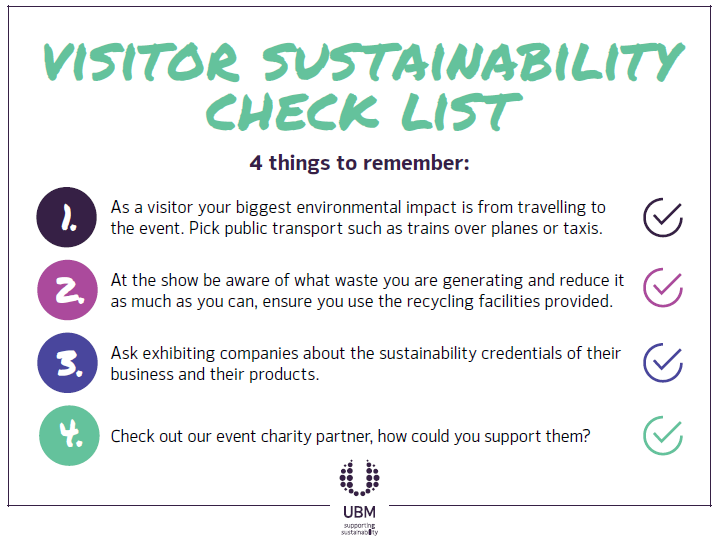 Being a sustainable business is central to how we run our events, how we make decisions, and how we do business every day. We are committed to continually improving the sustainability of Content Marketing World and aim to stay at the forefront of driving change within the events industry. Cleveland Convention Center is a LEED Gold Facility, earning its certification for green design and construction in the areas of energy use, lighting, water, and material use as well as incorporating a variety of other sustainable strategies. More info about the Cleveland Convention Center’s Reduce, Reuse & Recycle Program can be found in a recent press release and on their website. Conference guides are being printed on 100% recycled paper. We’ve reduced total printed signage (print signage being replaced with digital signage wherever possible). We’ve replaced foam core signage with signage made from 100% recycled cardboard substrate. Speaker gifts are made from recycled and “upcycled” materials. We’ve eliminated paper speaker evaluations in favor of electronic scoring. With the help of our venue and caterers, all catered food is locally grown and sourced. We’ve eliminated plastic water bottles in meeting rooms and our networking events in favor of using reusable water bottles. Once again we are partnering with a local, relevant charity called The Orange Effect Foundation. OEF’s mission is to ensure children with speech disorders receive the speech therapy and technology they need. We will be raising money and awareness for this great cause throughout the conference.